For anyone who has ever had a problem with dangling modifiers and split infinitives, or for those who have no idea what these things even are, My Grammar and I provides all the answers. While taking you on a tour of the English language, through a veritable minefield of rules and conditions for the grammatically unaware, and highlighting the common pitfalls that every English language user faces on a day to day basis, My Grammar and I also offers amusing examples of awful grammar, and will steer you in the direction of grammatical greatness. 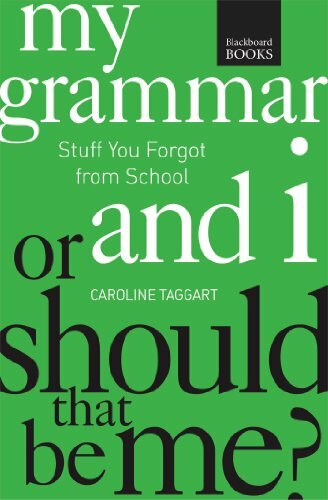 Factual and witty, My Grammar and I is the perfect gift for all English language sticklers. Caroline Taggart has been an editor of nonfiction books for nearly 30 years. She is the author of several books, including I Used to Know That. Taggart lives in London. J. A. Wines is a graduate of Oxford University and the author of several books on grammar and trivia.